Now I'm stuck because I use a good portion of the free 10 Gb I got from installing the quickoffice app 2 years ago. And of course there is no way to convert "full" pictures to "high quality" online, even though the "full" pictures are, as you stated, equal or below the 16 Mpixels limit! Same with me, my extra 10GB from QuickOffice expired today! So I'll have to reupload everything. The same is with Picasa. My camera is 12MP and if I upload photos as original - it counts. And otherwise I have to resize it to 2048x2048. Yes, on past year, all my photo is 4208px X 2368px , all photo taken by my android phone. And uploaded via Picasa web. And yes, it must count the storage space on that day, but now, it must not count because it is under 16MP. However, it seems, google apply 2 different policy to Google Photo and Picasa. And Google don't know peoples love Picasa Web more then Google Photo. Another issue - I have 40 GB photos (all below 16 mp) in a paid Drive. I can't see if I can cancel my subscription. I've just moved all my photos to Dropbox and disabled the Google Photos app on my phone. Stupid change. The difference is that not all 16 MP photos are the same. Get a 16 MP RAW image, compress it to JPEG with the highest quality settings and you can easily get a 15 MB file. If you allow Google to compress it using their algorithms, the file can shrink down to less than a couple of megabytes while still having an almost imperceptible loss of quality. Besides, 2048x2048 is only 4 MP, not 16. So the way I understand it, if you select the "high quality" option it works like it used to. For example, if a photo or video is already a small enough resolution than it doesn't change anything, otherwise it reduces the resolution for you. This basically how Facebook works as well. 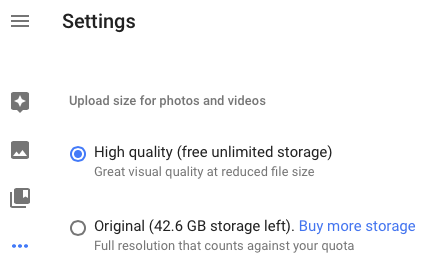 Google just gives you an option to pay to have higher resolution storage space. WRONG, all your uploaded media WILL be recompressed. To check by yourself, download it and compare with original. then downloaded the uploaded image. The original and 'high quality' image files were identical bit-for-bit. Flickr offers 1TB of free storage, and does not compress the orginal uploads. I don't understand why they give unlimited video in HD, while they limited the photo-quality. For my account, the amount of space all 'free stored' videos consume is far more than the space required to store photos. In whatever photo-resolution. If you store them with "High Quality" they will be cropped to <= 16MP AND reduced in filesize without comprimising quality too much. Which is true. Example: My original filesize is 8737 kB, Google's High Quality file size is 5240 kB. So it is 'compressed' by 3497 kB. If you pick Original it will take up the full size and will retain 100% of quality and size offcourse. Yes, this confused me at first too, but it actually makes sense: even if your photos are _smaller_ than 16 MP, Google's "High Quality" setting will compress them. It won't further lower their resolution, but it will reduce the file size. In my experience, the new compression algorithms are really great. So good that, at least with photos from my phone, I'm hard pressed to discern the difference when A-B-ing the original vs. compressed versions. And yes, it would be nice to have a way to save quota by telling Photos to compress already-uploaded photos from the Google+ or Picasa days. You can do this by deleting and re-uploading, of course, but what a pain. THIS. This is my issue. I have so many photos from my HTC One M7 that are taking up GBs of space... at 4MP / 2688x1520. I don't care if those photos are recompressed, but I don't want to download / delete / reupload TWO YEARS worth of photos. Yes, I unfortunately haven't found a way to see which photos are (accidently) in Original Size. Accidently because I flashed my phone many times for custom roms etc and then in the Photos app it was Original. So I need to recover 4.5GB for those photos. I am sorry to hear that. I am stuck with the same problem too. I think I accidentally selected the "original photo" option and I ran out of space for Google 15GB with Google Photos taking up many GB of space. Do you have any solution to it other than reuploading all the pgotos? Is there no way to check the sizes of photos I uploaded? You are wrong, doesn't matter whether you upload 3MB photo or 15MB, it WILL BE COMPRESSED. The same applies for video, as simple as this. I think it's because they change the format of the file when you choose the free option. Yes, they change a format (if needed) and recompress, ALWAYS. Okay. I thought that if the picture was under 16MP (as originating from a source that does has less than 16MP) it would be left alone. It's hard to tell how much quota a picture uses. The photos that were uploaded by the automatick backup can be traced through Google drive, and in the details window it says how much of your quota is uses (usually none). I've never ever uploades photos that may count against the storage but the drive usage shows that 40 MB for photos are in use. I'm unable to pick those items because there is not option to show photos that take up storage, otherwise I would delete them. This is unfair. My usage just about doubled over night when they switched to the new Google Photos. I have commented in that thread and tried all other ways to send info/query to Google. They are hard to connect with! Just pay for the storage and upload at full quality. I honestly spend more on coffee in a DAY than I spend on Google Storage to store my important family memories (photos) in a month. If we were talking hundreds of dollars I'd understand the need to complain, but seriously it's miniscule amount when you remember what you're actually getting. Google Photos, Google +Photos and Google Drive have quite a few cracks in the floor. I'm sure there are quite a few more that've driving some of us crazy for quite some time. ...Dear Google, you're revolutionized the database and networking worlds and done so at massive scale, unfortunately it's the smaller details causing the most pain. Can ya fix this please. Thanks. One possible reason: When you go for the unlimited up to 16MP size, Google will use compression. Images still look great but take up less storage space for them. An original file size might be 3 meg in my phone, once uploaded to Google Photos, it might be half that size. Selecting "original" will upload whatever size picture you have and I'm guessing not apply any compression. You get all this Google stuff for free, right? there are work arounds, apparently. Create a secondary account, share the original res photos with the secondary, they photos in the secondary account will follow current policy. which also is if its within the new free tier, its free even if you're set to original quality. Has anyone come up with a good way to review and renew their google photos? I have most (if not all) photos stored offline, but can't be sure. I want to reupload everything from scratch, but not lose anything.... where do I start? I assume someone else has looked at this before?